As the author of Laucala Bay – The story of the RNZAF in Fiji 1939 to 1967 I was invited to Suva, Fiji, for the unveiling of a monument celebrating 25 years of the RNZAF during the flying boat years at Laucala Bay. 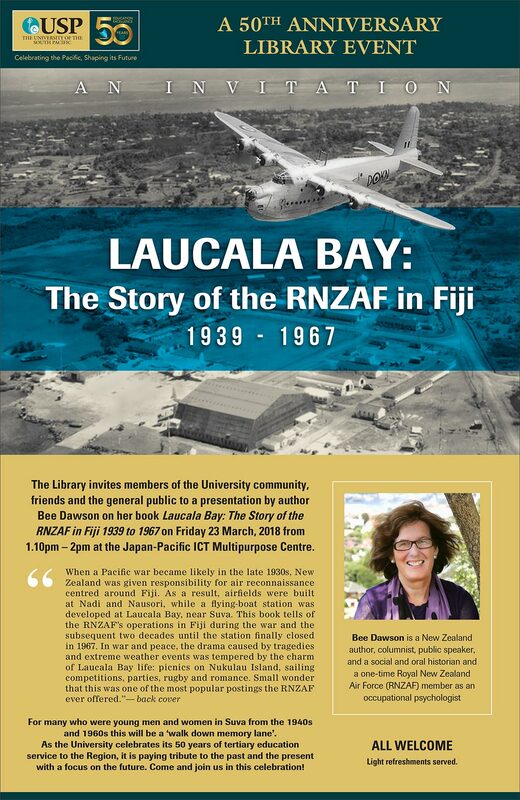 While there I had the opportunity to make a presentation on the book at the University of the South Pacific. The event received quite a bit of media coverage in Fiji, as did the book. A commemorative monument has been unveiled in Fiji to recognise the service of veterans from the Royal New Zealand Air Force’s (RNZAF) flying boat operations, based at Laucala Bay in Suva, from 1941 to 1967. RNZAF’s №5 Squadron conducted anti-submarine patrols, maritime reconnaissance and transport and air-sea rescue missions, flying Short Singapore, Consolidated Catalina and Short Sunderland aircraft. On September 3, 1939, the day New Zealand declared war on Germany, the New Zealand Aerodrome Services Branch of the PWD declared that “bare facilities” were open for operation at the flying boat operation, in Suva, a soon-to-be-released book says. “At that point the facilities amounted to a couple of mooring buoys and an expanse of water, not even the most elementary construction had been done,” wrote New Zealand author Bee Dawson. While members of the Royal New Zealand Air Force at Laucala Bay in Suva were preparing for war, their social life also came under scrutiny, a new book soon to be released, reveals. Rules were put in place to “protect them”, the book, Laucala Bay – The Story of the Royal New Zealand Air Force in Fiji 1940 to 1967, shows. Camp bounds were strictly laid down by the army authorities in the early days of the base operations and with Fiji firmly under British rule. “The following places are out of bounds to airmen: Nasese Village, Toorak Dance Hall, lounges of the Grand Pacific and Metropole Hotels. The excerpts from the book reveal an interesting perspective of life at the former flying boat base. Romance was in the air when the first 12 members of the post-war WAAFs (Women’s Auxilliary Air Force) arrived in 1953 at the Royal New Zealand Air Force base at Laucala Bay in Suva. As in the war years, romantic liaisons between WAAFs and the male personnel flourished under the tropical sun. LAST Friday marked a new beginning for Fijian and New Zealand defence ties. A monument was unveiled to recognise the service of veterans from the Royal New Zealand Air Force’s (RNZAF) flying boat operations who were based at Laucala Bay in Suva from 1941 to 1967. 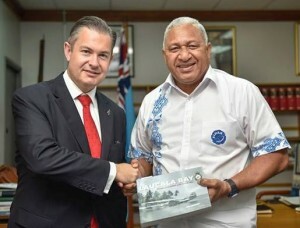 The unveiling of the monument also coincided with the visit by NZ Defence Minister Ron Mark and the celebration of the University of the South Pacific’s 50th Anniversary.